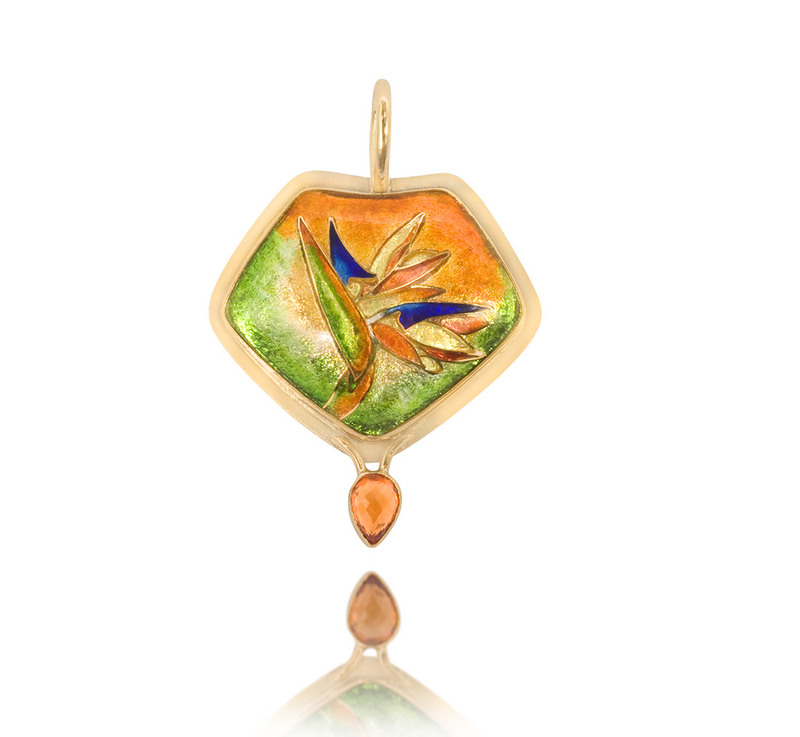 Bird of Paradise Pendant is a gold cloisonne jewelry piece created by Patsy Croft. It belongs to Tropics collection of amazing enamel jewelry with unique jewelry designs. Handmade Enamel Jewelry – Set in 22k Gold and Sterling Silver accented with a Teardrop Spessaratite Tourmaline. I have lived most of my life in tropical settings, and love the stunning Bird of Paradise. Here I have captured it in a gold handmade enamel jewelry piece, with silver and enamel, which creates a striking piece of enamel jewelry. Using fine silver for the background, and carefully applying 22k gold wire to draw the flower outline, has made this unique gold jewelry, one of a kind. With transparent vitreous enamel, the the jewel is painted in layers of beautiful color, creating this enameled jewelry design that is seen no where else. The fine colors of greens capture the depth of the tropical forest where this flower thrives. The background layers of peaches reflect the warm sunsets only seen in these lush settings. Oranges and blues fill up the petal components of the Bird of Paradise, mirroring the shape of a tropical bird in flight. Delicately below the enameled jewel lies a teardrop Spessartite Tourmaline which catches your eye and balances the gorgeous enamel colors. The whole metal canvas vibrates warmth, beauty. The ability to capture the wild in jewels is what sets my art apart as a fine gold enamel jewelry goldsmith. This is one of a kind, handmade enamel jewelry. This pendant measures 1.25” x 1.5”.